In terms of female happiness, women’s liberation was probably a mistake, and it was a mistake driven by technology that was, of course, invented by men. Let’s start with the device that forced women out of the home they so lovingly kept, wrenched their children from their arms and doomed them to perform unsatisfying tasks in the workforce in order to respond to new social norms: the washing machine. This infernal contraption was celebrated as a means to making a woman’s life much easier, and is now hailed as one of the milestones of women’s liberation. Almost no invention or political decision in history affected gender relations like the washing machine, because it effectively freed up half the human species to enter the workforce. But, it is my contention: this change left women unfulfilled and miserable. 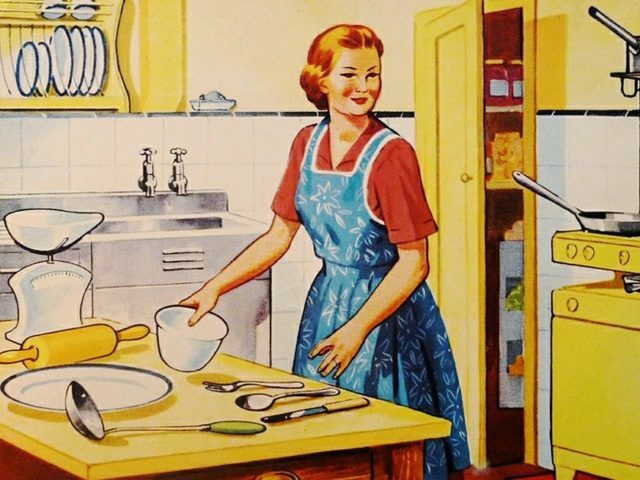 Feminist propaganda shoved in the faces of previously-content housewives told ladies they would be less happy if they weren’t working a gruelling job like their husbands were. This sort of thinking was designed to make women feel strong and empowered. But the fact is, women have become far more unhappy in the last 35 years. In fact every study shows the same thing: as women become freer, richer, better educated and have more choices, they get progressively more miserable. Talk of procreation leads me onto the next invention that seeks to actively destroy the lives of women: the contraceptive pill. The Pill is used to lower a woman’s estrogen levels and reduce the likelihood of her becoming pregnant. This was touted by feminists as a revolutionary form of contraception: finally, women were liberated to explore the world sexually with no repercussion! Except as usual, they were wrong and conservatives – and the churches – were right. The Pill has many repercussions, as does promiscuity. I’ve covered this topic in great depth before, but in case you missed it the first time, allow me to reiterate some of the key points. Birth control makes you fat, and as we all know being fat is disgusting and should never be allowed in a civilised society. A 2009 study from the University of Texas found that women using DMPA gain an average of 11 pounds over three years, a 3-4 per cent increase. Ladies: are you really so desperate to get laid that you’d willingly fatten yourself up like a prize-winning sow? Healthy, fertile women seek out men who are genetically different to them. Women on the Pill do the opposite, seeking out men who are closer to their own tribe. This perhaps is an explanation for the rise of feminized males, so desperate to get laid that they mimic the behaviour and mannerisms of women. They’re destined for heartbreak though. It’s well established that women lust after rugged, manly men during their fertile cycles, and prefer baby-faced “provider” types outside this period. Indeed, this alternating pair of desires is the leading cause of female infidelity. That process of alternate desires is ramped up dramatically when you introduce a medication that is constantly driving female hormones crazy. This of course makes women on the Pill far more likely to cheat. So, if you’re a man in a loving relationship with a woman, flush those pills down the drain as fast as you, or resign yourself to the inevitable cuckery. The pill causes cellulite. I know this seems outlandish, but I do have some research to back this up. According to the Scientific American, pictures of women with cottage cheese thighs are almost impossible to find prior to the 1970s. That doesn’t necessarily mean the Pill is responsible, of course. Other factors like increasingly sedentary lifestyles and the rise of fast food might have been responsible, but it’s more likely that it was a mixture of all these causes. Women have been propelled out of their homes into fast-paced work lives that most of them don’t want, encouraged to eat fast food and whacked on hormone-altering medication that wreaks havoc on their bodies. We know for sure what’s causing the epidemic of female unhappiness, but could it — just perhaps — have something to do with a woman’s changing role in society, the expectations placed on her to “have it all” and the effects of work, the Pill and being encouraged to think and act like men? In a tragicomic attempt to justify the situation they’ve placed themselves in, women have invented the “fat acceptance” movement to tell themselves that their ever-expanding thighs and lack of a love life are totally OK, and it’s men who are sexist for not being attracted to lardasses. Even I, the gayest man in the western hemisphere, can see through that one. This is the world that feminist propaganda has created: a world of unhappy women and feminine men, where self-medication, childlessness, and slaving away in a cubicle are touted as the path to utopia. Well, sorry, but count me out. And forgive me if I advise my female friends to avoid this awful situation like the plague. The special snowflakes who run Hillary Clinton’s presidential campaign would no doubt regard these views as “regressive social attitudes” but they’re better described as traditional family values, from a period in history in which we were all happier.